Are the Cruise Lines Leaving Money on the Table? Between 1948 and 1952, the European Recovery Program, otherwise known as the Marshall Plan, spent $13 billion putting Western Europe back on its feet after the Second World War. Fifty years later, we have the G20 talking about making $1 trillion available under the new Global Plan for Recovery and Reform, meant to rescue the world economy from its present economic crisis. 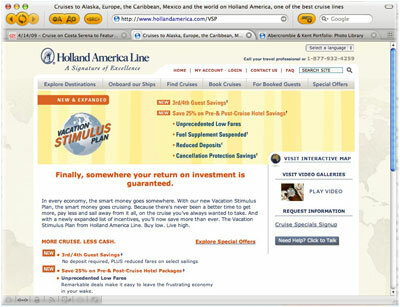 Meanwhile, we have Holland America Line mooting its Vacation Stimulus Plan, which includes deposits reduced by 50%, insurance by 25%, free or reduced third and fourth passengers and 25% savings on pre- or post-cruise hotels. Some cruise lines offer value added, and some huge onboard credits, while others simply reduce their fares. Where is this all taking us? Today one needs to remember that the cruise business is entirely in private hands, whether shareholders or families. No longer are there nationally-subsidized lines, £10 a head assisted passages to Australia or hard cash cruise lines like the Russians once ran to gain badly-wanted foreign currency. The entire industry is privately-owned, so whatever may be given away cannot be taken back in taxes but has to come directly from the bottom line ­ a question of profit and loss then. The point is that whatever incentives may be given to tempt the consumer to book a cruise, these decisions are all in private hands. In this environment, the strongest will survive and some of the weakest may fall. Some cruise ship owners such as Ambassadors International, Club Cruise and Hebridean International have already been affected, but with new tonnage that was ordered well before the slump still coming on stream, fares are likely to remain low for some time. Judging by the statistics received from Florida ports for January, demand for cruising seems to be strong despite a struggling economy. According to figured received from the Cruise Lines International Association (CLIA),Florida's two top cruise ports have experienced gains in 2009 over the same period in 2008 of 6.9% at Fort Lauderdale and 17.6% at Miami in numbers of cruise passengers processed in January. Two of the ports reported single day records. Despite the world economic crisis consumers seem to be responding positively to all of the offers that the cruise lines are making. Fort Lauderdale, now the largest Florida cruise port, handled just over 500,000 cruise passengers in January, for a 17.6% increase, and a single day record of 49,234 passenger moves on 11 cruise ships on January 3. 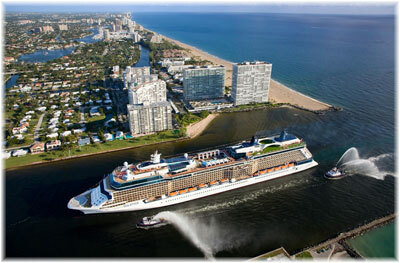 Miami processed 421,629 cruise passengers in January 2009, for a 6.9 percent increase over 2008. Of the smaller Florida ports, Tampa handled 84,546 passengers for a 17.8% increase; and Jacksonville processed 32,397 guests, an increase of 44.5% over 2008. Port Canaveral remained consistent with its 2008 numbers. According to CruiseOne and Cruises Inc, from a poll of 1,000 of their franchise holders, although revenue is down, many agents have seen an increase in passenger numbers. In fact, 40% said that Q1 2009 booking numbers are higher than Q1 2008. The remaining agents indicated that bookings were flat or have decreased, or were "unsure." While booking number are up, about 40% of agents reported a slight or significant decrease in revenue between the first quarter in 2008 and Q1 2009. This of course is due to the innovative promotions and lower pricing that are making cruising the most popular sector of the travel industry, which in turn is stimulating demand. 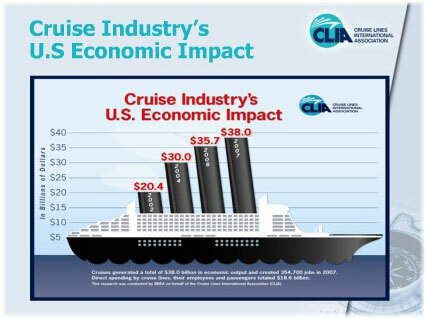 But in spite of lower revenues, most CruiseOne and Cruises Inc agents showed a positive outlook for the future. Of agents polled, about 44% saw a slight or significant decrease in revenue 2009 over 2008, and about 30% saw a slight or significant increase in revenue while about 7% indicated that business remained flat year-over-year. We have already carried anecdotal reports that passenger bookings are up in the UK by 25% or more, and these Florida numbers, while indicating smaller increases based on one month, pretty well confirm that trend. From the stock watchers we also know that yields are well down and they are worried about what that entails for the future. One big question is will all these specials continue? The Royal Caribbean group, which also include Celebrity, Azamara and Pullmantur, has already indicated that they are unlikely to allow prices to fall below a certain level. And even if Carnival's ratings are higher, both Royal Caribbean and Carnival have had their credit ratings downgraded because of investor doubts that they will be able to produce the kind of results shareholders are looking for. There are some very early signs in both the stock market and other markets that the economy may just, but only just, be beginning to turn around. But are these a false dawn? Investors are hoping that an earlier recovery will result in higher farse and better returns. For now, there are consistent reports that cruise bookings are up but yields are down, and investors are beginning to ask questions about this trend. But this is an industry where on of the old sayings is that if you build the ships the business will come. When times return to normal (if there will ever be a normal again, that is) all these new assets will be there and demand should be good enough to get prices up again. For now, however, they must be filled in order to keep things going. One result of this is that the industry may well be introducing a whole new generation to cruising and we know that cruising is a product with a high satisfaction rating. That at least is an investment in the future. One thing we know for sure, however, is that in the UK, fares were set based on a pound that is now worth 25% less than it was a year ago. According to Roger Allard, who is chairman of the group that owns Voyages of Discovery and Swan Hellenic, in a speech he gave last week, when the new brochures come out this will mean double digit increases. According to Allard, who fears a further drop in the pound under Brown, "the economy will get worse before it gets better." Is the message therefore to book now while fares are still low?